This is an old topic which is getting discussed since CRM 2011 or I think even before that. You must be wondering, why I am digging out history here. Well there has been so many blogs written about this. So what’s the problem statement here? Recently my customer wanted that whenever an email is being sent from Dynamics, it only needs to be sent through Queues. In other words in the From Lookup of the email, the user should not be able to select self or any other user from CRM. So there are basically two steps to it. 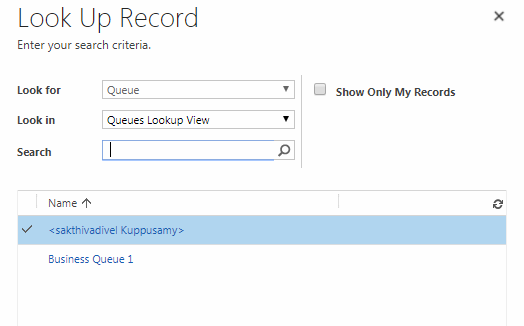 Since from is a multi-entity lookup, it shows both the user and queue when user tries to select. So the first thing needed is to stop the user from selecting the user entity and the next is to stop the user from selecting any user record in from. The other option, supported way, is to use the addCustomFilter. But with that, even though you stop from selecting a user, still the Entity selection of User/ Queue is available. So wanna try something new? Let’s do this. Open the Customization.xml in a XML editor of your choice and navigate to the section where the From field is present. You may find the unmodified=”1” in the attribute element as well as Email entity element. Remove the tags. Otherwise any changes you make here may not reflect in CRM once you import back. Scroll down a bit and you will see the section with the LookupType tag. Remove the entire element corresponding to 8 (Type code for user). Your final XML should just contain the one LookupType tag with Queue (2020). Re-import the solution and publish all customizations. Now go back to your CRM email. Try to select “from”. And get the delight. Now entity selection is disabled and you are just left with selecting the queue.